In celebration of 20 years since the first Harry Potter book was published, I thought it’d be a good chance to look back to one of my own offerings in which I offered a radical reading of Potter’s relationship to his magical art. By renouncing his special powers, Prospero becomes more fully human. Yes, I thought, the act of abandoning divine powers in order to become more fully embodied as a human? Abandoning a lonely paradise in order to be re-born in human community? Yes, that sounds like a seam worth mining. Magic is everywhere. Despite the best efforts of the Enlightenment and the pursuit of the scientific method to investigate our universe, stories about magic and fascination with magic have not only persisted, but blossomed. The most popular single volume fiction book of the past century, bar none, is the story of a hobbit and his adventures with wizards and a magical ring. The most popular book series has been that concerning a young wizard called Harry Potter. Not far behind is C.S. Lewis’ The Lion, the Witch and the Wardrobe. In each of the stories I pick up – and the book apparates deftly between Macbeth, Spiderman, Watchman, The Prestige… and the Bible – I explore how the promise of a super-natural power lures the hero into thinking that they can finally conquer and get what they desire… but then ends up dehumanising them and removing them from community, from healthy relationship. In fact, the most heroic thing that they do is to give up the very power that they believe had made them heroes. It is only in this renunciation of super-nature that they can become truly human, and thus truly perform the sacrificial work of salvation that they are called to. On the radio this morning, a theologian was talking about how the Potter books could show people how evil can be conquered with the help of a higher power. If this were true, it would be going against the grain of all these archetypal tales stretching back over the history of story. And I believe that Rowling is far too smart to do that. Instead, she has deftly offered generations of children a superb tale about how to navigate our way towards ‘becoming more fully human.’ Harry’s journey is from one of total ignorance about the magical world, through wide-eyed and naive joy, and on to healthy critique and – I would argue – rejection. And from that moment on, there is no mention of Harry performing magic again. Interestingly, though the final book is about the ‘Deathly Hallows’ – these super-magical objects without which Harry doesn’t think he can destroy Voldemort – he in fact uses none of them. He drops the resurrection stone, pulls off the invisibility cloak… and what eventually kills Voldemort is his own death-curse rebounding back onto himself. In fact, beyond super-nature, the essence of what allows him to overcome Voldemort (read: ‘the death drive’) is a power much greater: love. 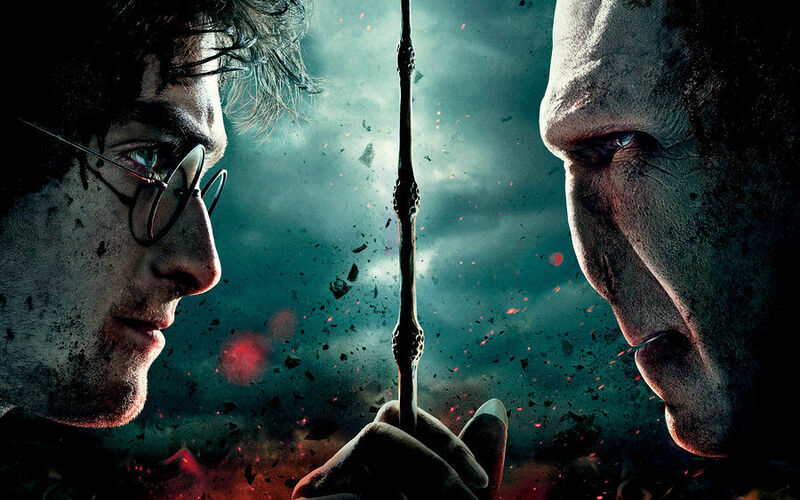 In the very final battle, as Voldemort sends the killing curse, Harry’s final spell is instructive: ‘expelliarmus!’ His last act is to try to un-wand his enemy, to take away his magical staff, offering even up to this last point a chance for Tom Riddle to re-enter his own humanity too. Magic has been more trouble than it’s worth, and he has now had enough trouble for a lifetime. The Harry Potter books are a great gift to children because they plot in almost real time this most extraordinary journey from naive childhood into the foothills of adulthood. This is the time of soaring passions and fundamentalist viewpoints. And what Rowling offers, I believe, is a modern-retelling of the most ancient archetype: that if we are to become fully human, we must slip off the cloaks of magical arts, the alluring powers that, at the birth of our individuation in our adolescence, promise to lift us above others into something more powerful and heroic. The most holy thing we can do is to destroy the idea of the holy, these hallows that promise life, but turn out to be deathly. 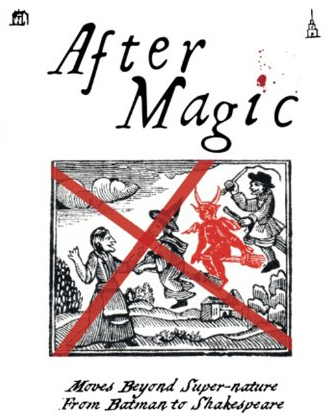 Despite its limited readership, I’m extraordinarily proud of After Magic because through myriad stories, ancient and modern, it paved for me the way towards the real (hor)crux: that it is not the transcendent, but the radical Christian narrative that fits this form so perfectly. It is here in the post-theist reading of the gospels that we see a young man, so troubled in birth, grow up to battle a great foe, realising that it is only in the laying down of his great powers, and his absolute association with the deepest essences of human existence – love and death – that evil will be unmasked and defused. That power is no more, and no less, than love for each other. Despite promises to the contrary, the introduction of a divine dimension to this love does not enrich our humanity, but reduces it. This, I believe, is right at the heart of Jesus’ teachings. It is not that these higher powers do not exist. As I have explained elsewhere, I’m the opposite of atheist: I think that it’s obvious that we are surrounded by forces – whether consumer capitalism or techno-optimism or state-sponsored communism – that impact on us as ‘super-natural demands,’ that lead our behaviours away from kindness and generosity and into something closer to delusion and madness. As we grow we are tempted by their promises, but maturity as human people means appreciating that the most godly thing that we can do is to put these godly drives to death (and do so over and over again as a eucharistic act) in order that we might become more fully human(e). This is as true for our view of divine good as it is for hellish evil. We cannot simply reject doctrines of hell until we reject the idea of an eternal heavenly paradise too. There will be no magical act to save our world, only our own human agency. In fact, Rowling performs both deicides in orthodox order: Dumbledore must die before Voldemort can be destroyed, because God must be forsaken before the devil is vanquished. The point about her Potter books is that neither can exist without the other: transcendent good and pure evil are co-created by our desire to overcome death, to escape the human dress, but we must first relinquish the promised prize – heaven – if we are to disempower the idea of hell. To attempt it the other way round simply will not work. So, three cheers for Potter at 20. They’ve delighted me and my kids and I for one am hugely grateful to Rowling for putting such extraordinary themes in a story cycle that – because it is so deeply rooted in archetype – will be read not for 20 more years, but 200. You can order After Magic here. Mmmm. Not sure you are right here. The final chapter of the Potter series is deliberately mundane but Harry is still deeply involved in the Magical world in his job and in his choice of school for his kids. Magic appears to have become normalised. Not sure this is a good thing, e.g. the banality of evil.